We like to call it “activity creep”. First, your son’s friends all sign up for gymnastics, so you sign up, too. Then, your daughter expresses an interest in language lessons, so you find time to fit them in. Then the birthday party invitations roll in. And the play date invitations. The next thing you know, your weekends are so tightly scheduled that you and your kids are left exhausted by Monday morning! Think about each activity you sign your kids up for, or each invitation you receive, and ask yourself whether you think your children will actually enjoy, benefit from, and look forward to this particular activity or event. If not, ask yourself why you are considering it? Are you trying to hit every mark, from gymnastics to math club to violin lessons? Are you attempting to stay in the good graces of the person who invited you to a party or other event? Prioritize the activities which your child will actually find fulfilling. Come up with a number of activities that will actually work for your family. Maybe one activity per weekend is going to max out your family. Or perhaps your energy levels are such that balancing three or four per weekend actually works for you and your kids. In either case, figure out where your limits are and stick to them. Remember to plan each event and activity so that there is a bit of downtime in between them. Younger kids may need to nap in between outings, and older kids and adults simply need some quiet time at home to recharge. The ability to take breaks throughout the day is crucial. Give yourself room to add to your weekend if you like. If your weekend is so packed with activities that there isn’t room for anything else, spontaneous, fun family activities will be impossible. If your kids want to ride bikes to the park and go for ice cream, or if their grandmother calls and wants to take them out to lunch, you want to be able to fit those kinds of activities into the schedule. Schedule in quality time to be with your kids. Remember that in addition to ballet, soccer, and piano, your kids most need you in their lives on the weekends. Whether it’s a family breakfast in bed or some quiet time reading together at the library, remember to retain some time for family bonding. Are your weekends out of control? 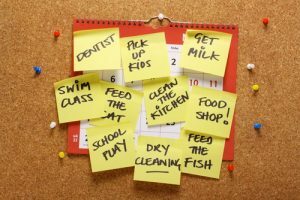 Or have you been able to come up with a schedule that works for your family? Let us know how you kept activities, birthday parties, and other commitments under control in the comments section.